Photo courtesy of The Whiting. 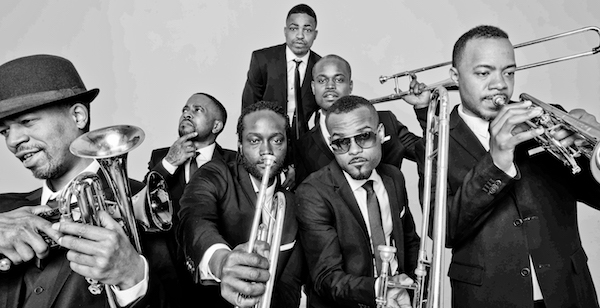 FLINT, MI – Chicago’s Hypnotic Brass Ensemble has performed on six different continents with everybody from Prince to Mos Def. Saturday, they bring their act to Flint. The event follows the completion of a $37 million restoration of the Capitol Theatre and is being hosted as part of the facility’s soft reopening program, which began on Dec. 8, 2017, with a performance by the Flint Symphony Orchestra. “We’re really looking forward to giving Flint something they can’t see anywhere else,” said Gabriel Hubert, one of the group’s members. Tickets for the Apr. 14 concert are available free of charge from the ticket center in The Whiting’s lobby or from The Whiting’s booth in the Flint Farmers’ Market.